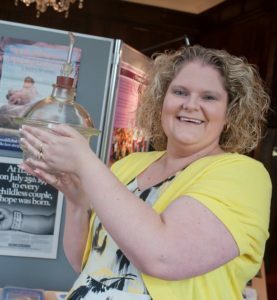 The story of IVF 6 million babies later is to be featured in a new exhibition at the Science Museum, to mark the 40th birthday of Louise Brown, the first baby born following IVF treatment. The IVF 6 million babies later exhibit will explore the ten years of experimentation, hundreds of failed attempts and many setbacks faced by Robert Edwards, Patrick Steptoe and Jean Purdy in their determined quest to treat infertility and achieve the first successful IVF birth. The trio went on to establish the world’s first IVF clinic at Bourn Hall near Cambridge. Visitors will be able to see one of the ‘Oldham Notebooks’, as they are known, that record the scientific data collected by Purdy and Edwards between 1969 and 1978, as well as examples of the equipment they used. Over 10 years, the notebooks record data for 282 anonymous women, 457 IVF cycles and attempted egg harvests, 331 attempted fertilisations and 167 cycles with embryos, but only record five pregnancies and two successful births. After Bourn Hall Clinic opened its doors in September 1980, Steptoe, Edwards, Purdy and their team continued their research, achieving a number of key publications, including “Current status of in vitro fertilisation and implantation of human embryos” (Edwards & Steptoe, 1983), in which they reported the results of their first 1,200 IVF cycles and report an increase in clinical pregnancy rates from 16.5% initially to 30% by 1983. It was their work at Bourn Hall that transformed IVF from an experimental technique to a robust medical therapy and this was discussed in 1981 when the world’s first IVF conference was held at the clinic. The exhibition will include the glass desiccator used by Edwards to incubate embryos and some of the personal correspondence and gifts received by Louise’s parents from the public around the world. These items were brought to Bourn Hall by Louise in 2015 when we hosted the launch of her autobiography. A number of our staff who worked with Steptoe and Edwards in those early days were involved in research for the exhibition and contributed items to the display. 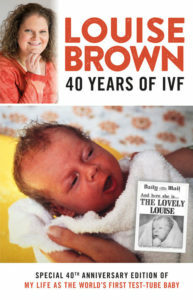 Curator Connie Orbach says: “The birth of Louise Brown 40 years ago was a defining moment in reproductive science and a testament to the dedication and drive of Edwards, Steptoe and Purdy. IVF has now enabled the birth of more than 6 million children worldwide. The exhibition will explain IVF science and explore the many reasons people undertake assisted reproduction and the huge commitment involved. Louise has updated her autobiography and it is available here. IVF 6 million babies later will be free to visit and open daily from 5 July 2018 until November 2018. Bourn Hall hosted a memorial for Jean Purdy the ‘forgotten’ IVF pioneer more details here. Bourn Hall hosted an afternoon of talks on 18 July for healthcare professionals looking at 40 years of fertility advances and what’s next in the field. This will soon be made available as a podcast. If you would like to received details do send us your email address.